In this book, author Anthony Gierzynski argues that the American elections are in a sorry state, with the problems known to even the most casual observers. Large portions of the public are disengaged and uniformed. Voter turnout is low; in fact, it is even lower than voter turnout in most other democratic nations. The electorate is cynical about elections, politics, and government and appears poorly informed on many important issues and the basics of the American political system. Elections are lacking in the competition necessary to make electoral choices meaningful: lopsided redistricting and unequal distribution of campaign money mean that many races provide voters with no viable choice. When the elections are competitive, the way voters make their choices often renders election outcomes meaningless in terms of actually directing government policy. The state of elections in America has attracted a lot of attention from academics, reformers, and other observers, and there has been no shortage of reform proposals aiming to improve the state of elections. Each year, hundreds of reform proposals are introduced in legislative bodies, or proposed as initiatives throughout the United States. There are numerous good government groups lobbying on behalf of a wide range of “fixes” from campaign finance reform, to term limits, to nonpartisan elections. The courts also often find election reform on their dockets because other interest groups often challenge the Constitutionality of the reforms that have been enacted. What has been lacking in all of the discourse over American elections (both within and outside academic circles) is some way to sort through all these fixes for elections––a way to sort out the good reforms from the bad, the effective from the ineffective. How does one know what fixes will work? How does one know that a “fix” will not make things worse? What type of reforms are actually needed? In this book, Anthony Gierzynski addresses the state of electoral reform discourse by offering a new approach that borrows from the field of medicine. Doctors do not prescribe treatment until they have a diagnosis. The same should be true of those who prescribe treatments for American elections. In order to sort through all of the election fixes that have been prescribed, what is needed is a diagnosis of what is actually wrong with elections––not a diagnosis that focuses on one or two aspects of the problem, but a full diagnosis. This book works up such a full diagnosis of the problems besetting American elections, drawing from the extant research in political science and other disciplines. It utilizes research and data on elections, the mass media, political parties, and public opinion. Once complete, the diagnosis makes clear what is needed to improve the state of elections. If one then adds in the state of knowledge from the extent research literature, the author argues, one has a template that not only points out the needed treatments but also which treatments are likely to be effective. Gierzynski then uses this template to sort through and evaluate the prescriptions for elections that involve the media, the electoral structure, political parties, electoral law and administration, and the public itself, while offering a few of his own. He concludes the book with a list of prescriptions that addresses what has been diagnosed, along with what have proven to be effective or likely to be effective. It offers what was missing with regard to election reform—a big-picture way of evaluating what is wrong and what needs to be done (i.e., a holistic approach to election reform). By putting reform proposals in the context of a complete diagnosis of the system, it becomes obvious which changes to the political system will address what is actually wrong. Combining the diagnosis with what the research has proven on the likely effectiveness of various treatments, Gierzynski argues, offers the best way to assess prescribed reforms. The effect of such an approach results in some surprising conclusions regarding election reform. Beyond the prescriptions proffered in the book, the framework Gierzynski develops for evaluating reform proposals can help scholars and others sort through any new reform proposals. The framework can also prove useful to the reform community by helping them focus on what needs to be done and what can be done, channeling their efforts in ways that would be more fruitful. Furthermore, it can help lawmakers evaluate reform proposals. It also makes clear areas of elections study that are in need of further research from the scholarly community. This is an important volume for all political science collections focused on elections, election reform, parties, and democracy in the United States. 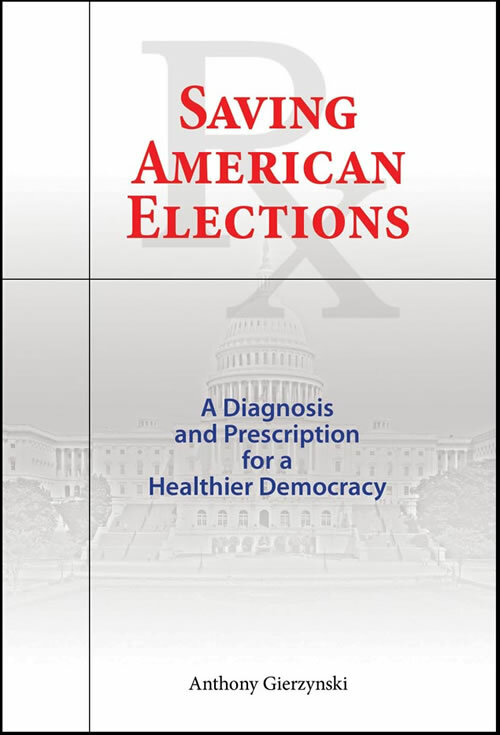 Not only a valuable resource for scholars, this book will also be of interest to the election reform community and those who have a more general interest in American elections and democracy.